In practice, the fire resistance of autoclaved aerated concrete (AAC)is more than or as good as ordinary dense concrete 1 An important reason for the AAC good fire resistance is it's is relatively homogeneous structure, unlike the normal concrete where the presence of coarse aggregate leads to dierential rates of expansion, cracking and disintegration. Normal concrete fire related loose of form starts at 400-600°C Closed autoclaved aerated concrete pore structure pays much to the the fire resistance of the material, as heat transfer through radiation is an inverse function of the number of air-solid interfaces traversed. This coupled with autoclaved aerated concrete low thermal conductivity and leads the the fact that autoclaved aerated concrete performs better fire resistance properties. The autoclaved aerated concrete blocks homeowner should be aware of AAC compressive and splitting tensile strength. What will happen to the AAC compressive strength after the real house fire? Fig #1: Heat test AAC color changes (Image courtesy of S. Somi, 2011). other hand average compressive strength of blocks after fire test was about 2.074MPa which shows a slight decrease comparing to compressive strength of dry state. After 30 minutes heating procedure with temperature of 300°C no changes were observed on the appearance of AAC blocks but slight reduction in weight of blocks was detected. On the other hand average compressive strength of blocks after fire test was about 1.809 MPa which shows more decrease in compressive strength comparing to lower temperature heated samples. 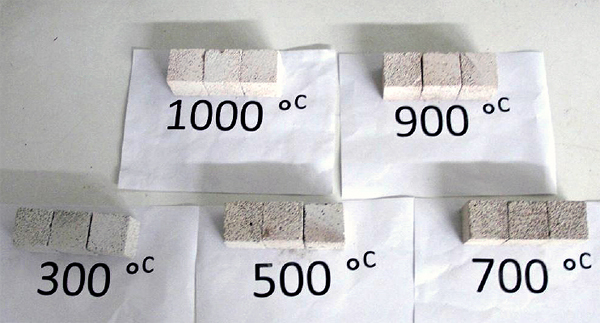 After 30 minutes heating procedure at the temperature of 500°C, color of AAC blocks was observed to become darker, and slight reduction in weight of blocks was also detected. On the other hand, average compressive strength of blocks after fire test was about 1.65 MPa which shows more decrease in compressive strength compared to lower temperature heated samples. After 30 minutes heating procedure at the temperature of 700°C color of AAC blocks was observed to become darker, also reduction in weight of blocks was detected. On the other hand average compressive strength of blocks after fire test reduced to 1.43 MPa which shows more decrease in compressive strength comparing to lower temperature heated samples. After 30 minutes heating procedure with temperature of 900°C, changes in color from grey to light grey for AAC blocks, became more obvious and in addition to reduction in weight of blocks cracks also appeared on surface of blocks. On the other hand average compressive strength of blocks after fire test reduced to 1.23 MPa which shows more decrease in compressive strength comparing to lower temperature heated samples. After 30 minutes heating procedure with temperature of 1000°C, color of AAC blocks became bright white and in addition to 0.006 kg reduction in weight of blocks, number of cracks on the surface also increased. On the other hand no compressive strength was obtained for these blocks after heating procedure at a temperature of 1000°C. In this study, heated AAC blocks found a slight increase in the strength while heated up to 400°C. At the higher temperatures the autoclaved aerated concrete compressive and splitting strength falled down to zero (decrease in AAC strength 6 times or more) at temperatures above 800°C. Loss of strength of autoclaved aerated concrete at high temperatures occurs also in fiber reinforced autoclaved aerated concrete blocks and blocks with perlite replacement. So can the fire damage and destroy autoclaved aerated concrete walls house? To answer this question we need to know what the temperature are reached during a fire inside and outside buildings. Table #3 "Standard fire"* temperature dynamics. *Standard fire - the empirical model used in the evaluation of fire resistance of structural elements of buildings. In a real outdoor fire the equilibrium temperature (due to heat loss to the environment) of about 680 ° C is set. In indoor real fire without gas exchange with the outdoor atmosphere and without the presence of gasoline and other combustibles temperature reaches 800-900°C. In indoor fire with the gas exchange to outdoor atmosphere, or where high energy combustible materials are present temperature above 1000°C can be reached. The maximum temperature of an open fire for combustible gases is 1200 - 1350°C, for the combustible liquid is 1100-1300°C and for solid combustible organic material is 1100-1250°C. Thus, after a fire in the house made of autoclaved aerated concrete be sure to make an examination of the AAC wall blocks strength, which determines the carrying capacity of the aerated concrete wall by the material strength. For comparison, the ordinary dense concrete can be deformed (with the formation of through-holes or through-cracks) after 5 - 20 minutes of indoor fire (with temperature range 400-700°C)9 In thin-walled reinforced concrete structures (40 - 200 mm thickness), hight heat leads to the formation of through holes and cracks. In walls thicker than 200 mm, overheating leads to spalling of the concrete layers, and formation of cracks. 8 The same, Chapter 9.1.